“I’m here to work, not make friends,” said the non-team player. 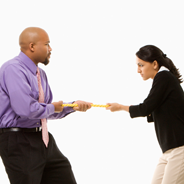 Every team experiences conflict. What separates mediocre teams from high performing teams is not the absence of conflict, but how the team manages conflict in their daily interactions. In this morale boosting webinar, you will learn how to cultivate an environment of trust, respect, support and collaboration with peers and subordinates to succeed. Our 60-Minute live webinar will be held on Wednesday, August 5th at 12:00 p.m Central Time. You will receive an email with instructions for watching live via Adobe Connect, or calling in and downloading the webinar workbook.